Jason Rohrer has set Sleep is Death's price at anything, so whip out that wallet and take as little or as much out of it as you want. Pay-what-you-want, where games are sold for any price purchasers choose to pay, is the "in" thing for independent developers these days. The latest game to take the route is Jason Rohrer's newest title, Sleep is Death. 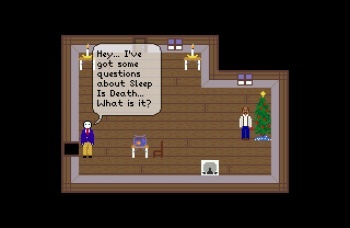 Sleep is Death is a very unique game. Paying what you want, down to a minimum of $1.75 to cover payment processing fees and download bandwidth, will earn two downloads of the game. The reason? Sleep is Death can only be played with two people. One player "plays" the game while the second player basically creates it. It's a storytelling game where one player is the storyteller. Sleep is Death comes with plenty of scenes, objects, and characters to create a story with, but players can also make their own. Players can share objects and there are already packs of resources available for download from Rohrer's website. Really, the best way to understand Sleep is Death is to watch this slideshow. The bottom line is that another really cool title just became worth whatever you deem it, within reason. Some recent pay-what-you-want sales, such as for World of Goo and the Humble Indie Bundle, allowed people to pay less than processing fees. Rohrer and his family are known for practicing simple living, so it makes sense for him to at least cover his costs here.